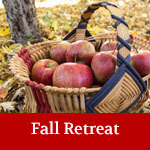 This year’s fall retreat takes place just in time to enjoy the autumn foliage in a charming New England town famous for its covered bridges. 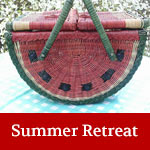 Come for a day of workshops for weavers at all levels. Leave with a completed basket. 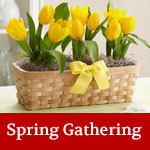 Enjoy the company of new and dear basket weavers from New England. Four workshops are offered at a nomial fee. Class times are varied. Lunch Break with NBG update. Basketmaking tools: scissors, flat head screw driver, pencil, tape measure, old hand towel, a dozen clothespins, a utility knife or hunting knife. If you will be weaving the shoulder tote, bring a hammer! NBG will provide coffee, tea and water. If you can bring food to share during the day, please let us know on the registration page. Questions? Contact co-coordinators Lyn Parker Haas or Carolyn Noah . 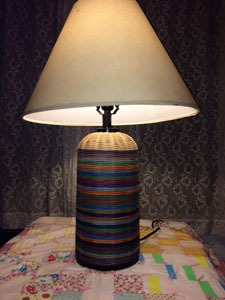 We’ll make a 7” diameter (14” weaving area) by 25” lamp base. Students will use 3-rod wale and step ups, with a choice of design options, including multi-colors, like the sample. A metal lamp base and round reed will be provided, but not the lamp shade. Basic tools are needed. Who doesn’t need another lamp? *Students bring a hammer. Must know the basics of weaving. 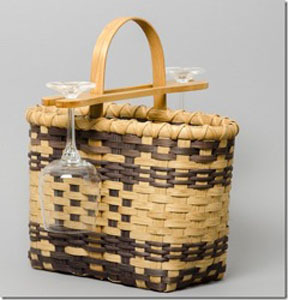 Weave this handy wine carrier with a separate wooden attachment for 2 wine glasses. Woven on a wooden “D” handle with natural and dyed reed of varying sizes. Learn to do a filled bottom and a woven divider inside the basket that keeps your bottles separated. 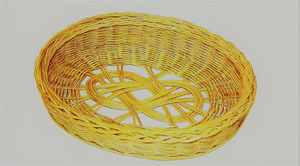 The basket is 12”x 6” x 9” (15” with the handle). Regular basket weaving tools are required. Wine and wine glasses not included. Sorry. This 9” x 7” x 2” inch basket is based on a pattern by L. Zanger. 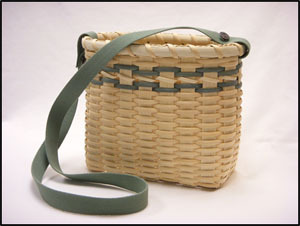 Woven with round reed, the base is an intricate Celtic Knot, which includes lots of twining, a four-rod wale, and the top finished with a 4-part braid. Basic tools are needed.